As far as I can tell, Big Hero 6 is the first animated (non-Pixar) Disney film following the shocking phenomenon that was Frozen. While Big Hero 6 doesn’t stand up to Frozen’s financial/cultural impact, it’s considered the superior film critically (albeit by the slimmest of margins) which is an accomplishment worth mentioning. I liked Frozen quite a bit (although not quite as much as just about every female under the age of 26) but, for me, Big Hero 6 was better in just about every way (especially because it wasn’t a musical [which probably hurt its potential]). After graduating high school at 13, Hiro Hamada (Ryan Potter) doesn’t really know what he’s doing with his life. For now, the robotics/engineering prodigy is satisfied hustling unassuming chumps at local “bot fights”… but his brother Tadashi (Daniel Henney) sees bigger things on the horizon for him. Using his fraternal wiles, Tadashi inspires Hiro to enter a contest to win a spot in a prestigious tech-focused higher education program. 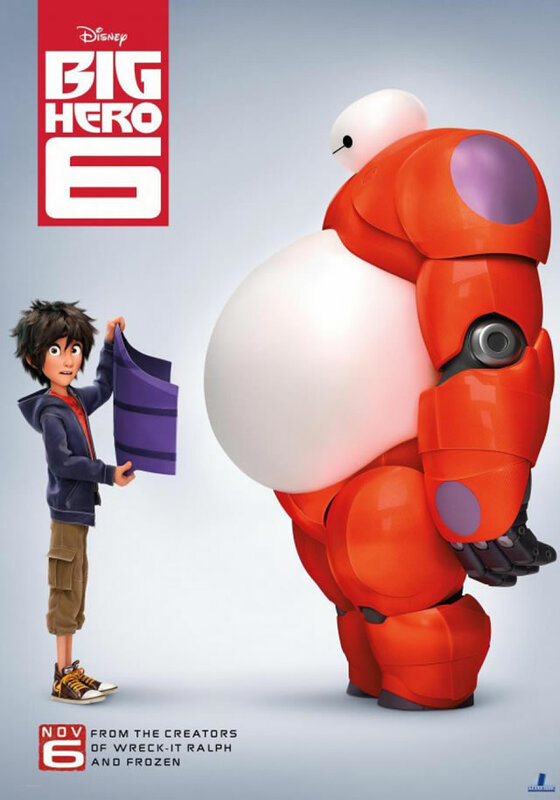 But when tragedy strikes, Hiro struggles to find purpose and meaning until Tadashi’s revolutionary healthcare robot Baymax (Scott Adsit) puts him on the path to find the cause of his life-changing tragedy and set things right. That tragedy does more than simply set the story’s main arc into motion; Hiro’s struggle to cope with and make sense of the tragedy is what the movie is largely about. It’s about dealing with loss and trying to become whole and restored afterwards. Baymax’s stated purpose is to be a personal healthcare companion and, after diagnosing Hiro, he tirelessly endeavors to do whatever he can to improve Hiro’s post-traumatic state. That’s what Hiro unsuccessfully tries to accomplish for himself as he searches for answers and (eventually) for revenge. Contemplating the dangers of seeking revenge is nothing new in any type of story, but Big Hero 6’s resolution (don’t worry, revenge is still not good) is presented in a simple yet profound way that felt pleasantly novel. An easy way for a movie to win my heart is to feature/portray nerds in flattering light. Big Hero 6 gives us not only a cool, genius (and Asian) teen as our protagonist, but also a reasonably diverse crew of überdorks, all of whom are equally capable of handling themselves in a battle of wits or a battle for their lives. It also helps that each of those characters had a pretty distinct and distinguishable personality, ranging from Jamie Chung’s too-cool Go-Go to Damon Wayans Jr.’s burly but neurotic Wasabi. A highlight in particular from the crew was T.J. Miller’s Fred, who more or less appeared to be a computer-generated version of Miller himself, which is positive if you’re a fan of his particular comedy stylings. Even with a great supporting cast of characters, a brunt of the movie falls on Scott Adsit’s lovable Baymax. Fortunately, Adsit does a remarkable job of adding substance, depth and life to the rotund robot and it’s not long before we fall in love with him. The absurdity of Baymax’s oversized body and the predicaments that he found himself in earned plenty of laughs early on. Baymax could be counted on as a consistent source of adorable comedy on the order of Wall-E or Olaf (high praise, I know). From an interesting, likable group of characters struggling with a serious threat to beautiful and strangely lifelike (at times) visuals, Big Hero 6 hit all of the major, necessary notes for me. It also offered some unexpectedly poignant perspectives on mature topics while delivering some honest laughter and entertainment. The balance between gravity and levity that Big Hero 6 manages to achieve works perfectly. I was so pleased with the experience that I wouldn’t be surprised to see myself pre-order the Blu-ray… which is not something I could say for Frozen.